Soap and water won't clean metals very easily. That takes a special cleaner - or you can try lemon juice or vinegar (white works best)! 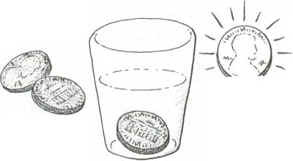 Soak the coin in lemon juice or vinegar for 5 minutes. You fish out a shiny coin! Oxygen in the air combined with the copper to form the dull copper oxide coating. The acid of the lemon (or vinegar) acts chemically to remove the oxide, and the result? A bright copper penny.